Well first of all, what are cruciferous veggies? Vegetables such as cauliflower, broccoli, cabbage, kale and other leafy greens, Brussel sprouts, arugula, turnip, radishes, kohlrabi, watercress, bok choy and others are considered crucifers. The origin of the name comes from the shape of the flowers of the vegetables whose four petals resemble a cross. Cruciferae is Latin for cross bearing. You can’t find another vegetable group that is as high in vitamin A carotenoids, vitamin C, folic acid, and fiber as the cruciferous vegetables. As a group, these vegetables are simply superstars. They are a great source of anti-oxidant nutrition which is one of the reasons why these veggies are protective against cancer. Vitamin K is a nutrient that helps regulate our inflammatory response, including chronic, excessive inflammatory responses that can increase our risk of certain cancers. 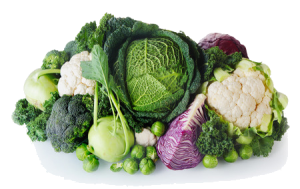 Some researchers suspect that the amazing K content of cruciferous vegetables is related to additional cancer-preventive properties through mechanisms involving better control of inflammation. In addition, 100 calories’ worth of cruciferous vegetables provides us with somewhere between one-third and one-half of a gram of omega-3 fat (333-500 milligrams). Omega 3 fats also offer substantial anti-inflammatory effects. But the biggest buzz about crucifers is related to a group of phytonutrients (plant-based nutrients) called glucosinolates. Scientists have now identified over 100 different glucosinolates in food, primarily in cruciferous vegetables. The major benefit of glucosinolates is cancer prevention. The breakdown of glucosinolates by plant enzymes occurs when cruciferous veggies are chopped or chewed. This results in the formation of biologically active compounds, such as indoles and isothiocyanates which are responsible for the anti-cancer action. Isothiocyanates have antitumor properties. They work by turning on genes that activate cell-death pathways in cancer cells. Indoles can dramatically induce favorable effects on estrogen metabolism. This beneficial effect has the power to greatly reduce the risk for estrogen related cancer for both genders (i.e. breast, ovarian, prostate). Both indoles and isothiocyanates have been found to inhibit the development of cancer in several organs in rats and mice, including the bladder, breast, colon, liver, lung, and stomach. We have an abundance of fresh crucifers to choose from in the grocery store all year long. Just keep it simple and focus on adding these veggies whenever you can to your meals. 1. Add arugula and watercress to your salads. 2. Chop cauliflower into tiny pieces to create “cauliflower rice” and lightly sauté. 3. Try adding shredded kohlrabi to your coleslaw. 4. 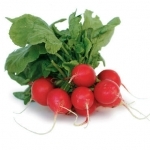 Serve fresh radishes with hummus or veggie dip. 5. Roast Brussels sprouts with olive oil, garlic, shallots and walnuts. 6. Stir-fry Bok choy with garlic, ginger and soy sauce. 7. Sprinkle fresh lemon juice and sesame seeds over lightly steamed broccoli. 8. Use cabbage leaves to wrap your next taco or burrito. 9. Add shredded cabbage to sandwiches as a change from lettuce. 10. 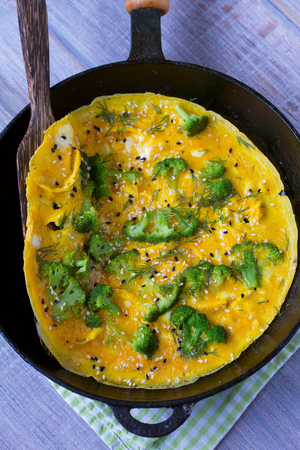 Add chopped broccoli to omelets and frittatas. 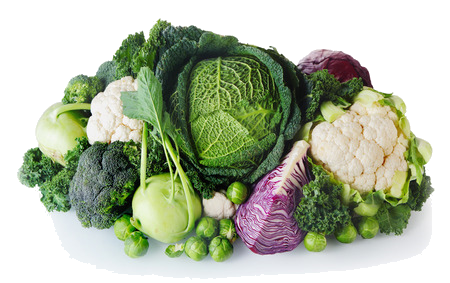 Cruciferous veggies have it all — fiber, vitamins, minerals and phytonutrients. Do your best to eat them regularly.